Hello there! What are you up to right now? Still kicking back and savoring memories from Christmas day? I hope you had a great day, no matter what or how you celebrated. We had a wonderful holiday. The day started off early, with a super-excited ten-year old. After presents were unwrapped (I know presents shouldn't be the focal point of Christmas but it is a pleasure to be able to surprise your child a little bit), we sat down to breakfast. Despite my attempt to whip up something different for Christmas morning breakfast, the little guy wanted his usual "pancakes and bacon" so we had Dutch baby pancake with a side of bacon, washed down with Barcelona hot chocolate (regular hot chocolate for the little guy). Ultimately, everyone was happy! The rest of the day is something of a happy blur! It involved plenty of playing, talking, and eating! I remember lots of Christmas cookies and what feels like meal after meal. The last few days have essentially been this way on repeat. We're having fun sitting around the table playing monopoly, Ticket to Ride, and Jenga - mixing old-school games in with xbox time - while munching on all the Christmas goodies Santa and others brought us. This is indeed a precious and wonderful time. I'm still kicking back with my family until New Years and enjoying every moment. Are you going out for New Year's eve? Planning a romantic dinner at home, or a loud family gathering? We stay in, keep things simple, and celebrate the imminent new year with a good meal around the table. I haven't quite decided what I'm going to cook but I'm thinking seafood. Dessert is also very important so I have a lot to mull over in the next two days. In the meantime, I'll finally get to the subject of my post - a coffee crème brûlée. It's adapted from My Paris Kitchen, one of the cookbooks I'm getting a chance to visit more thoroughly now that things are quieting down a bit. 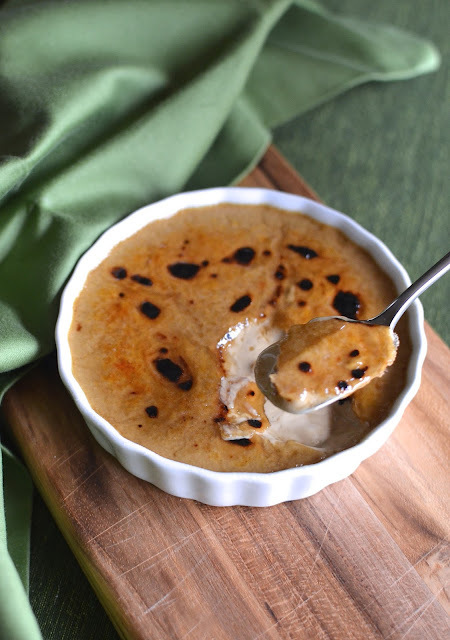 Crème brûlée is a great make-ahead dessert and the taste is usually nothing short of luxurious and delightful. This one tastes like Vietnamese coffee, with a delectable flavor combination of sweet caramel from the top layer and a coffee custard beneath. We use instant espresso (or coffee) powder and Kahlúa to produce the coffee flavor so it's quite simple. I love having my husband home during the holidays so I can whip up different treats to share with him. He is my best taste-tester and cheerleader! He also has an abundant appetite, and I'm amazed he's been able to maintain his weight in the last few years without much effort or conscious thought. Let's hope that remains the same in the New Year! A quick word on the recipe. 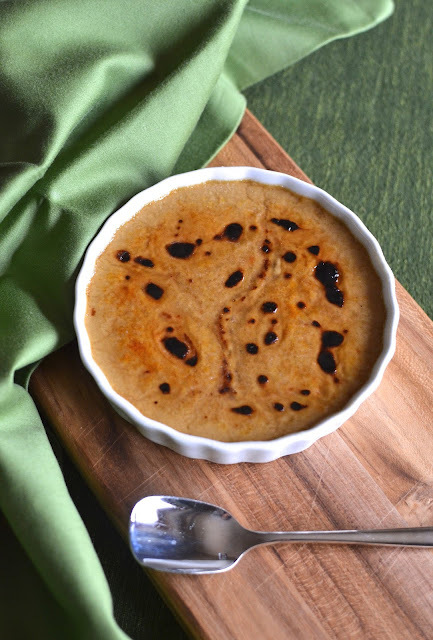 I like to use a relatively lighter combination of half whole milk to half cream for the crème brûlée custard, and I followed that formula with this coffee version. I think using less cream makes for a somewhat looser custard but I really like it, partly because it lets the flavor shine through a bit more. In this case, you get the coffee flavor by simply stirring in instant espresso or coffee powder (I used espresso), along with a little splash of Kahlúa. The result is really delicious combined with that hard layer of delicious sweet caramel once you apply the sugar on top and work the brûlée magic. We literally wanted to lick our dish clean! Preheat oven to 300 degrees. Bring a kettle of water to a boil and set aside (you want to use hot, not boiling water for the water bath). Set two 6-ounce ramekins in a baking pan. Place the milk, cream, sugar, and salt into a small saucepan. Heat until sugar is melted. Whisk egg yolks together in a bowl. Gradually add the warm cream mixture to the yolks in a steady stream, stirring gently with a whisk (do not whisk too vigorously because you do not want to create foam) until combined. Mix in the espresso powder (taste, and adjust by adding more espresso powder, if desired). Strain mixture into a large measuring cup. Finally, stir in the Kahlúa. Divide custard into the ramekins. Carefully pour hot water into the baking pan until water comes about halfway up the side of the ramekins. Bake for approximately 20-25 minutes, or until custard is set and just barely jiggles when moved. Remove ramekins from the water bath (a large metal spatula works well), let cool, then cover with plastic wrap and chill in the refrigerator for at least 2-3 hours until firm. Right before serving, sprinkle each ramekin evenly with sugar, about 1 1/2 teaspoons for each. Use a kitchen blow torch and very carefully caramelize the sugar until you have a layer of dark golden brown caramel. Let sit for 2 minutes before serving so the caramelized sugar can harden into a thin crispy layer that shatters under your spoon. Haven't had a creme brulee in ages...though I don't drink coffee, I do LOVE sweets flavoured with coffee. Hope you have a great celebration to usher in a great New Year, Angie. Thank you! Whoaaaa. Coffee creme brulee sounds incredible Monica!! It sounds like you had a very merry christmas! We don't have any big plans for NYE but we have a gathering on January 1st that I'm excited for! Happy New Year!! It's funny because NYE will be quiet but we also have plans with family on New Year's day and the day after. Good to mix things up. Have a great 2016!! The only thing that can make creme brulee better is coffee!! Love this!! Yes, love that! Thanks, Ashley! Oh yummmy! I love David's recipes so I know you enjoyed this. Everything's better with coffee. It sounds like you had a wonderful Christmas. Having a happy 10 year old is everything :) Playing games as a family is the best! We are going to my husband's boss's house for New Years Eve. I would rather stay home but sometimes you gotta do what you gotta do :) Happy New Year Monica! Thank you, Jess! It was really tasty! Have a great New Year! I'm surprised you don't drink coffee! : ) Thanks, Lorraine...and have a great New Year! Coffee makes any dessert taste even better! Your creme brulee looks amazing! So nice of you...thanks, Melanie! Don't you just loving have the whole family home during the holidays. Lots of cooking and baking and lots of creme brulee making. Do you have one of those torches? I so need a creme brulee torch in my life and a coffee creme brulee in the other hand. Wishing you a super 2016! You said it! Everyone home is so lovely and my son is beyond thrilled that his dad is off this whole long week so there's so much time to spend together! Hi Monica, we are staying home for New Year's like we normally do. I love just hanging out. Your coffee cream brulee looks wonderful. I received a blow torch last year and I have been afraid to use it, you have inspired me once again. Happy New Year's! That's exactly how I feel...no need for an agenda, just hang out, eat, relax, talk, read, play - repeat! : ) I was very nervous the first time I used the kitchen torch but it's not that scary now. You have a great New Year's as well! Be happy and healthy! Thank you, Kelly! Enjoy the rest of this lovely holiday week. All the best to you and your wonderful family in the New Year!! I love creme brulée, but I don’t like caramelize sugar topping, I feel it leaves an unpleasant chemical taste behind. We discovered crème brulée when we moved to France and although it is one of my wife’s favorite desserts.. thanks for sharing..